When I bought this set of prints from Jellybeans at the end of July my plan was to use some white frames I had picked up the month before. Only the whites didn't match. So the prints sat until this week when the hubby and I finally got in gear and picked out some frames. We opted to get some custom mats, so we dropped off the prints and the frames with the framing department at Hobby Lobby. At which point it became a comedy of errors. They stapled through the frame. The frames we had bought were (we discovered) a discontinued item. We had bought the last two in Huntsville. By Friday, however, we had everything sorted out (we took the slightly damaged frame, they gave us the matting for free) and they finally came home with us. 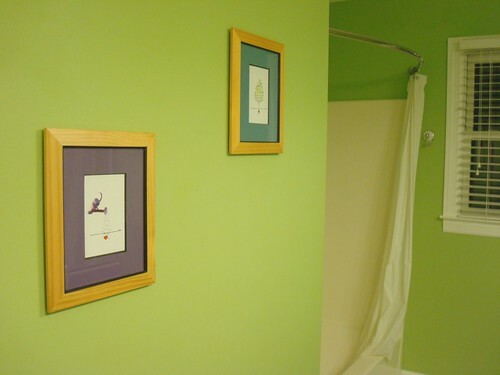 Today, we hung them in the bathroom, an homage to green and growing things.